Happy December 1st!! My goodness...I can't believe that the end of the year is almost here!! And I am SO excited to be getting back to my normal crafting routine....part of which is the WPlus9 preview at the beginning of every other month!! For December we have some beautiful love & floral themed stamps/dies to share with you...I think you are going to just love them!! 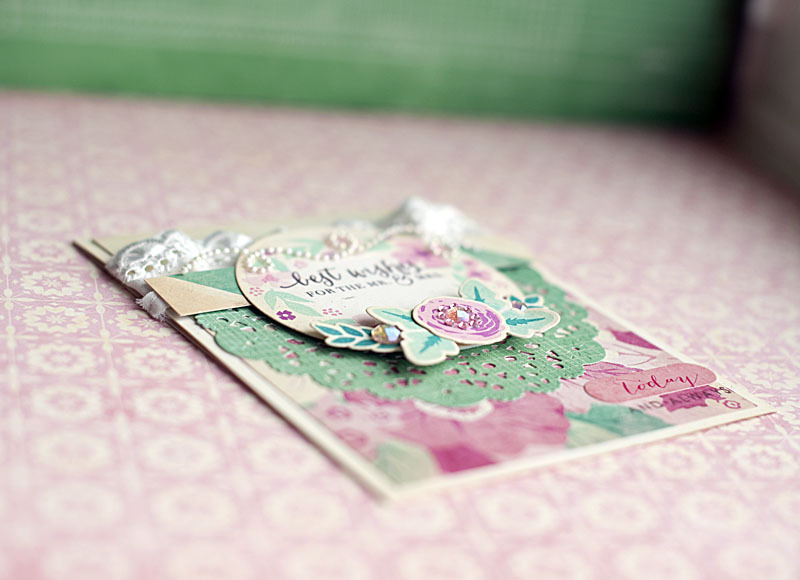 I combined the stamps and dies with some beautiful Crate Paper & Prima Marketing rhinestones. I also used Sketchbook Saturday #110 as inspiration for my design. Here is what I created!! 2. Cut floral paper slightly smaller, then adhere a lined paper strip to the top. 3. Distress ink the edges, then adhere the entire block to the card front. 4. Diecut the doily from green paper, cut the top off & adhere to the bottom. 5. Add a strip of eyelet lace, then a strip of striped paper to the top of the doily. 6. Diecut a circle from oatmeal cardstock & distress ink the edges. 7. Stamp the wreath directly to it. 8. Diecut the flower & leaves, then stamp accordingly. 9. 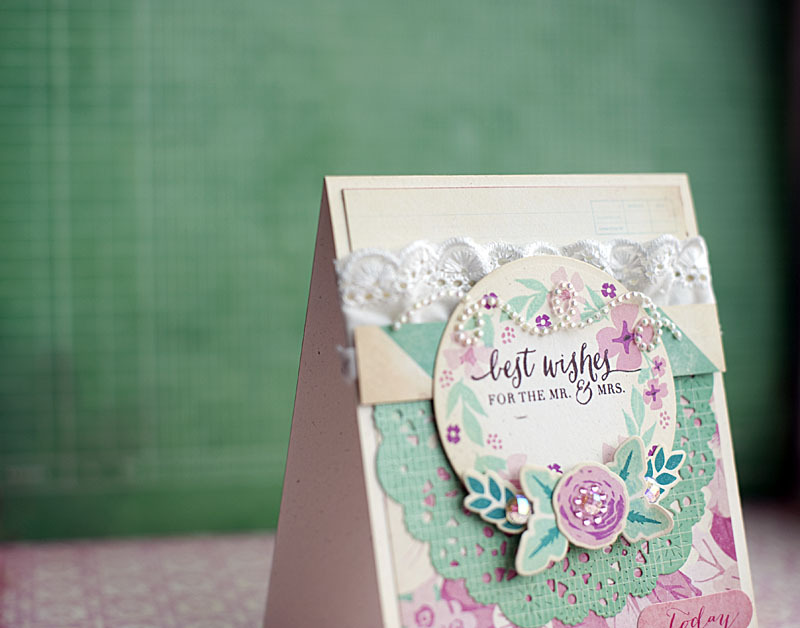 Adhere the stamped circle & flowers layers to the front using foam adhesive. 10. Accent them with a jewel swirl & pink jewels. 11. Add a sticker & finish the sentiment in the lower right corner. Aren't those stamps sets just gorgeous!! There are so many possibilities with these stamps & what you can build with them. The other WPlus9 designers have projects to share as well, so be sure to check them all out! 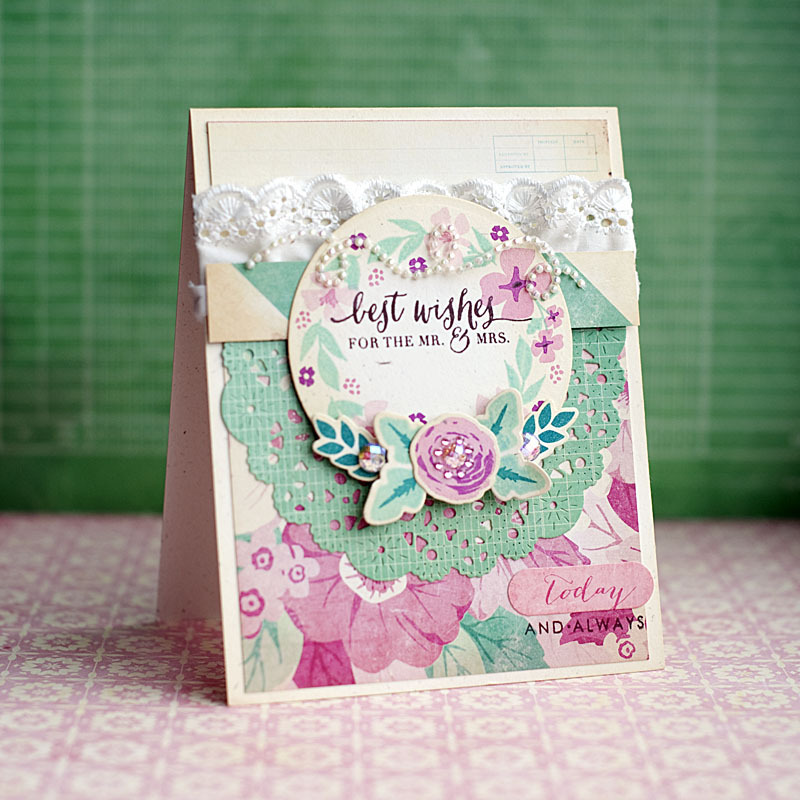 I will be back tomorrow with another look at some of the new WPlus9 stamps & dies! Have a lovely Sunday! its gorgeous! love the colors! Drop dead gorgeous! Fabulous colors! Beautiful layers and an awesome use of embellishments. Fabulous card! Totally love this card! I can see that playing with these new wreath sets would be fun. Love the gems and pearls too, the perfect touch. Thanks for sharing. Oooo! That background paper works so well with these blooms! Another beautiful creation! So awesome!! My favourite pairing of colours and my favourite company's stamps, I'm drooling here!